Robert, Lord Bradleigh, is a wealthy earl recently betrothed to a beautiful young girl in her first Season. Emily Townsend is an impoverished spinster hired as a companion to his grandmother, the dowager countess. Robert agrees to help his grandmother find a husband for Emily, but how is he to bear the thought of her in another man’s arms? This was my first published book, and the first book I ever wrote. In its early stages, it won several local RWA contests. One of those contests, Romancing the Novel, sent the winners in each category to an editor. Mine went to Judy Stern Palais at Berkley/Jove. She liked the entry (two chapters) enough to request the whole book. Unfortunately, I had not yet completed the book. So I sent her the chapters I’d completed (about a third of the book) and she offered me a contract. I was extremely lucky to sell a book without a completed manuscript, and I will forever be grateful to Judy for jump-starting my writing career. I confess that the first character to be fully developed for this story was the dowager countess. In my head, she had the distinctive drawling voice of my friend’s Great Aunt Ruth. And so the dowager came to life first as a voice, then as a complete character. I created this story with sequels in mind. The hero, Robert, has two best friends and I planned a book for each of them. Jack’s story became A Change of Heart and Sedge’s story became An Affair of Honor. Romantic Times BOOKclub awards 4 stars to A Proper Companion. Their review says: "Regency connoisseurs will hail the stylish debut of Candice Hern, a striking new talent of superior merit. What a joy to discover such a noteworthy new writer, one whose intelligence, wit, and craftsmanship are as impressive as her elegant romantic sensibility." 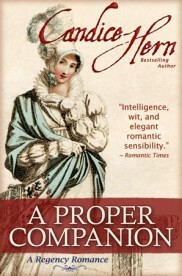 Under the Covers Book Reviews says: "Candice Hern's Regency, A Proper Companion, is a proper little gem. Each character is distinctly individualistic and beautifully crafted. She knows how to create characters along with the best. This is just one of her strengths. Her plotting is seamless and there is passionate care in her writing for each word, each raised eyebrow and jutting chin. Even the title has a dual nuance. Highly recommended." A Proper Companion hit #2 on the list of bestselling historical romances on the Kindle UK, and stayed there for 2 months. A Proper Companion was nominated as Best First Regency Romance by Romantic Times Bookclub. Emily looked up to see the earl as he stood framed in the doorway. She sucked in her breath as she gazed at one of the handsomest men she had ever seen. He was quite tall and broad of shoulder, fairly dwarfing the elderly Barnes. His dark chestnut brown hair fell in a deep wave over one brow. He was still covered with the dust of the road, which, together with the mischievous gleam in his brown eyes and his boyish grin, gave him an appearance more youthful than his thirty-five years. He had relinquished his greatcoat to Barnes along with his curly brimmed beaver. Though slightly ruffled from the drive, he nevertheless appeared quite appealing in his dark blue superfine coat of impeccable cut, buckskin breeches, and top boots. His cravat was simply tied and his shirtpoints were conservatively low. Although he obviously patronized an excellent tailor, his dress spoke more of comfort than of high fashion. Emily stared openly at this man of whom she had heard so many tales. He was no doubt handsome enough for a rake, but there was also a certain boyishness about him which was most appealing. “My dear boy!” exclaimed the dowager as she stretched out her arms to her grandson. In two quick long strides Lord Bradleigh was at her side, clasped her to him in a fierce bear hug, and then swung her through the air like a young girl. “Put me down, you fool! I am an old woman!” she snapped, although her eyes gleamed with delight. “You have not lost your charm, I see.” The dowager glared up at him, still somewhat breathless. Without warning her eyes darkened, and she reached up and soundly boxed his ears. “How dare you!” she said. Completely startled, Lord Bradleigh stammered, “W-what is this?” while he rubbed his stinging ears. Emily had observed the unusual scene with amusement. Failing to completely suppress a smile, she offered the Gazette to Lord Bradleigh. He turned, and for the first time noticed Emily’s presence. He hesitated a brief instant as his eyes caught hers, full of amusement but with a hint of caution. He turned to the dowager with a questioning look. Emily nodded and dipped a tiny curtsy. “Lord Bradleigh.” She smiled as she held out the crumpled Gazette. He returned her smile with a look in his eye that caused her knees almost to buckle as he took the newspaper from her hand. So that’s what it’s like, she thought, to be stared at by a rake. It was a most unsettling experience. Lord Bradleigh glanced down at the Gazette, and his eyes immediately caught the announcement of his betrothal. “Oh,” he said blankly. Clearly he hadn’t yet seen the announcement, though he did not appear entirely surprised. A fleeting expression of irritation crossed his face. Emily guessed that his unexpected visit to Bath was to let his grandmother, the Cameron family matriarch, know of his plans, and he would not be pleased that his future in-laws did not have the courtesy to wait until the Cameron family had been informed before sending an announcement to the papers. Or was she reading too much into a momentarily furrowed brow, and making hasty judgments based on the dowager’s low opinion of the Windhurst family? Emily tensed as the dowager bellowed. This was likely to be a very uncomfortable conversation. “Please sit down, Grandmother, Miss Townsend.” Lord Bradleigh led the dowager to a small settee by the window. Charlemagne scrambled up on her lap. The earl reached down and tickled him behind the ears. “Bonjour, mon petit carlin. Veilles-tu sur ma grand’mère?” he whispered to the pug. Emily smiled at this gesture. Everyone who was acquainted with the dowager was quickly made to learn that the pug must be addressed in French, as the dowager was convinced he comprehended only his native tongue. Despite her curiosity about Lord Bradleigh, she had no desire to be a part of what was sure to be an awkward meeting. This was a family matter and none of her concern. She excused herself to allow the dowager privacy with her grandson, saying that she must speak with Mrs. Dougherty, the housekeeper, about arranging rooms for the earl. She would also have fresh tea sent up. He paused as Barnes brought in a fresh pot of tea along with slices of plum cake and tiny apricot tarts. The dowager poured a cup of tea and handed it to the earl. He took a restorative swallow. “True. The field was wide open, in fact, despite my … er… reputation. But then I realized that I would prefer that she not be a giggler or a chatterbox. That eliminates half the Season’s crop. And I cannot abide a watering pot. You see how the field narrows. And I would have no patience with a clinging vine. So now very few candidates remain. I would especially prefer that she be practical and businesslike in approaching marriage. I would be most uncomfortable with a female who fell head over heels in love with me when I know I could never reciprocate such depth of feeling. I wanted a woman who could accept me on those terms without reproach. And I believe I have found just such a one. Lord Bradleigh’s face became grim, although his eyes twinkled with amusement. “Now, Grandmother. You must try to maintain a civil tongue when discussing my betrothed. Oh, I know what you think of Lady Windhurst, but, after all, she’s not the one I’m going to marry. Augusta is cut from a different cloth altogether. She will make a fine countess.” He squeezed her hand. “I had hoped for your blessing,” he crooned in his most seductive tone.